Bike corrals in Toronto are traditionally seasonal. This one is on Spadina in front of the Robertson Building. With great power comes great responsibility. And with great bike lanes comes a greater need for bike parking. Especially on a street like Bloor where it’s already impossible to find bike parking on any sunny day. It’s not at all unusual to see bikes parked to gas meters and stop signs due to the lack of ring-and-posts and abundance of cyclists shopping and dining in the Annex and Koreatown. 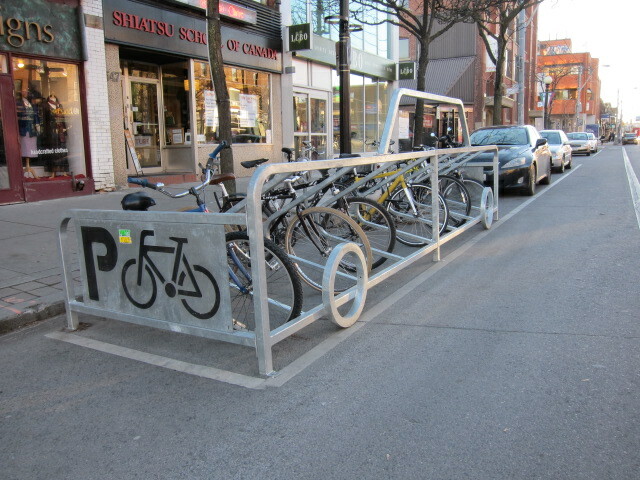 The City says that new bike parking corrals, which can hold 12-14 bikes, will be installed in the next couple of weeks but details as to where they will be located or how many will be installed are not known at this time. Apparently, there are budget issues. The City acknowledges that it has fallen behind on bike parking, but there does not seem to be any real plan to invest in more parking in the immediate future. In the meantime, it's being done as needed on an ad hoc basis with Business Improvement Areas being relied on more heavily to invest in street furniture like bike parking racks. Still, Bloor will be getting a much-needed parking boost... soon-ish. 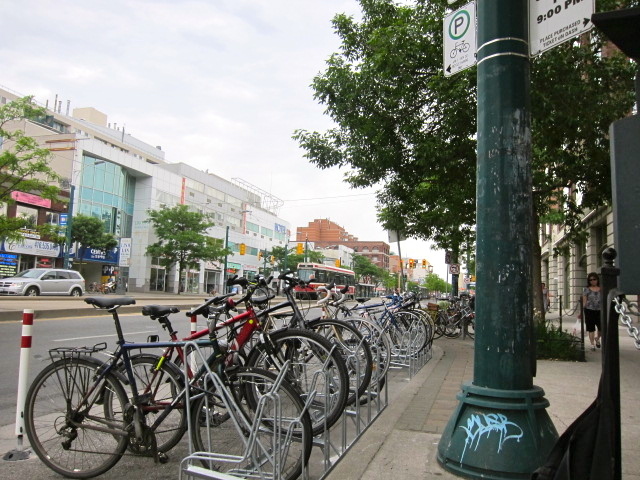 “[City] staff are working on getting more bike parking installed along Bloor Street in the pilot area and are hoping these can be installed over the next two weeks or so," says Jacquelyn Hayward Gulati, Acting Director, Transportation Infrastructure Management. The good news is that next year, bike parking will receive a real boost with support from the Annex BIA. Cressy adds, “The bottom line is that the Bloor bike lane is going to increase the number of cyclists shopping and stopping along Bloor and additional bike parking is needed." At dandyhorse we believe that every new bike lane should come with an education campaign for drivers and cyclists, and, of course, more bike parking! Layton agrees, “New bike parking should be considered with every new bike lane installed at the City." Funny how we plan so much in Toronto but yet when it comes time to actually install something, we seem to have run out of money. In the meantime, be sure to tell ALL the shop owners in the area that you’ve arrived by bike! A bike corral shaped like a car on College street, adjacent to a busy bike lane that is known for it's unfortunately preponderance for dooring incidents. Bike Spotting at the Augusta bike corral: Do you want more bike parking? This is about priorities, not money.